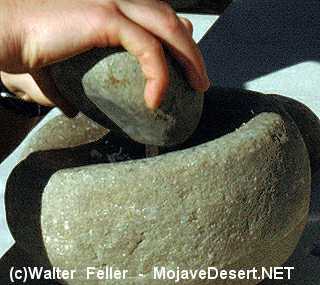 The Mojaves used rectangular blocks of lava as metates with a cylindrical muller to grind corn, wheat, and beans, but are unlikely to have brought these to the Project Area. Here they probably used portable mortars and manos from locally available stone-if they did any grinding of these grains here. 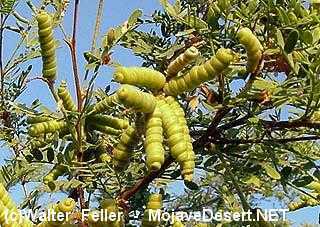 Stone pestles or long wooden pestles with wooden mortars were used to grind mesquite beans. They "cooked" fresh screwbean meal by putting the beans in an enormous pit lined and covered with arrowweed, and sprinkling them with water from time to time to turn them brown and sweet after "about a month". The Mojave unbacked bow made of willow was about the height of a man, and was used with a feathered Pluchea sericea (arrowweed) arrow lacking a foreshaft and stone tip. A club made of mesquite wood, and a straight stick club of screwbean wood were also used. These were principally weapons of war, but were also used for hunting game. The Mojave caught fish in fiber seines or in basketry scoops, and used them in stews. They may have brought dried fish to the people living at The Oasis of Mara from time to time. Hunting was in general not the major source of subsistence that it was with other groups, but may have been in the Project Area. Pottery was made by coiling clay and patting it with a paddle. It was painted with yellow ochre that turned dull red on firing. Ceramic vessels and tools were used as water jars, cook pots, spoons, ladles, plates, platters, parchers, and bowls, and were decorated with named designs. The Mojaves were not as interested in basketmaking as other groups, and tended to use baskets made by their trading partners. Their own baskets were "flat receptacles in an irregular plain twining or open-stitch coiling," twined fish traps or scoops, wicker hoods of splints for cradles, and a kind of carrying basket made of two U-shaped sticks wound with string. They made bags and wallets of bean string and akyasa fiber that were of better quality.